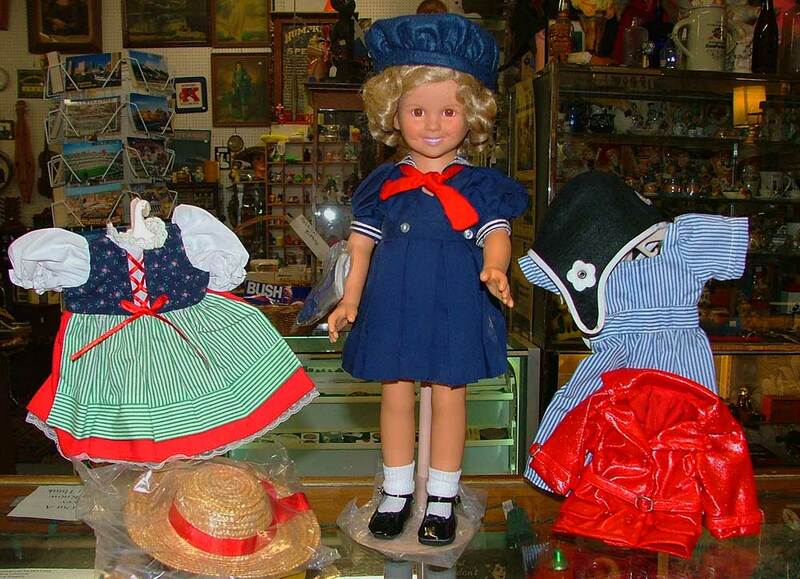 This 16″ vinyl Shirley Temple Dress-Up Doll is in exceptional condition. The outfit to the right is “Little Princess” and includes a white fur cape that adds so much to this gorgeous white gown with Gold Trim. On the left is from “Wee Willie Winkie” and sports a kilt, jacket, and beret! We don’t often post an item with prices, but we’ve had 16 outfits for the Shirley Temple Dress-Up Doll but no adult. 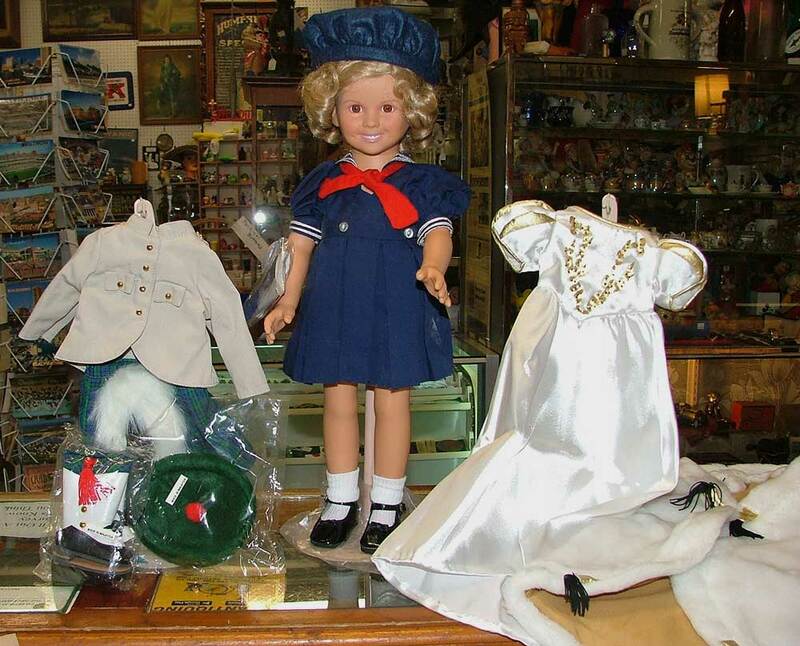 $175 for 16″ Shirley Temple Dress-Up Doll and 6 outfits. 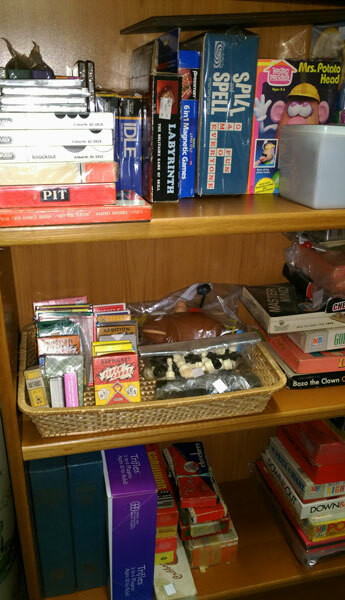 All items are in original boxes, many with original certificates. Many of the outfits have never been out of their wrapping (other than when we took photos)! Same doll with two more outfits: Heidi (on the left) and Bright Eyes (on the right). “Heidi” needs little explanation since most of us know the story. It’s a cute dress with a big straw hat and red ribbon. On the right is an outfit from the movie, “Bright Eyes.” A great faux leather jackets and more. 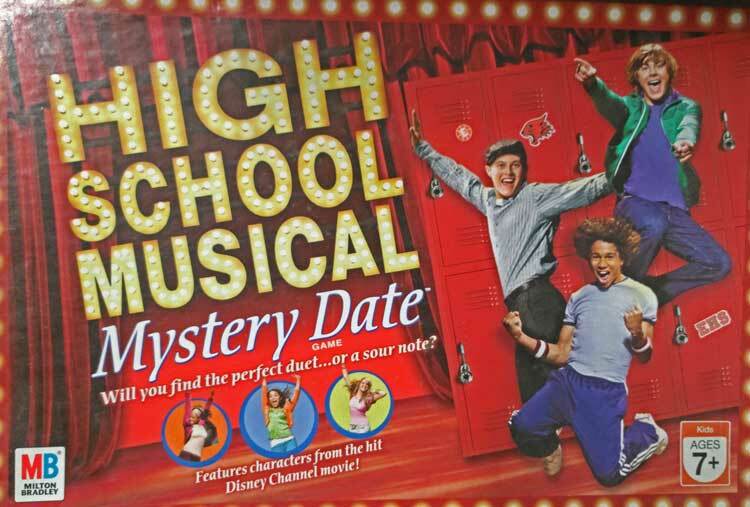 Again, it’s one doll with 6 additional outfits. I might note that we have 16 outfits. You can choose the 6 that come with the doll for $175. If you want the balance of the outfits (10 in all), talk to George! CLICK THIS LINK if you’re interested in locating the movies or viewing some on Youtube. Come in and check this out. Would a young lady on your holiday list love this gorgeous doll? Or maybe as a collector, you would love to own this. Either way, stop by Bahoukas today for the doll and 6 outfits – or all 16! We’ll be watchin for ya! We Salute and Honor The American Worker today! 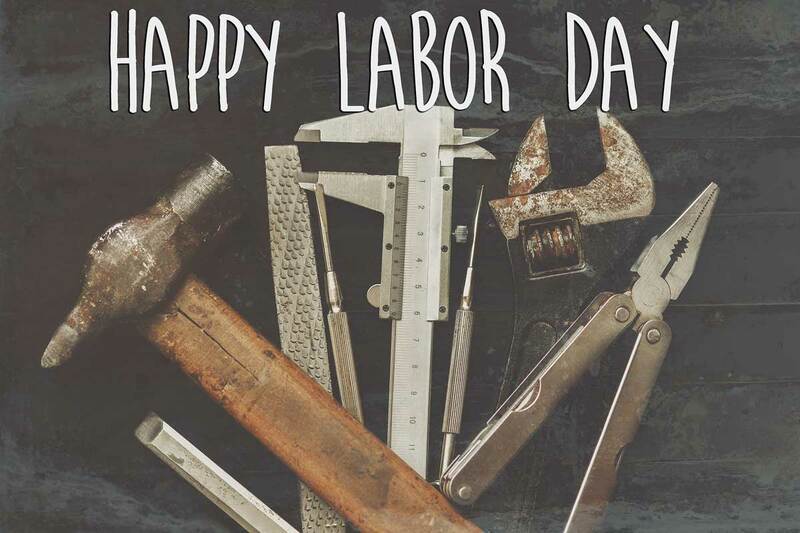 We wish you and your families a Safe and Wonderful Labor Day Celebration! July 4th – America celebrates her Independence. We might remind you that this is also National Country Music Day according to holidayinsights.com and to let you know that we have plenty of record albums – yep, including Country Music! If you happen to need a record player, we have a few of those, too. Since we’re celebrating “Christmas in July,” you’ll also receive 20% OFF everything throughout the month. So stop by, we’re open all day! And yes, we’ll be watchin’ for ya! Yes, it’s a long weekend and there’s sun in the forecast. 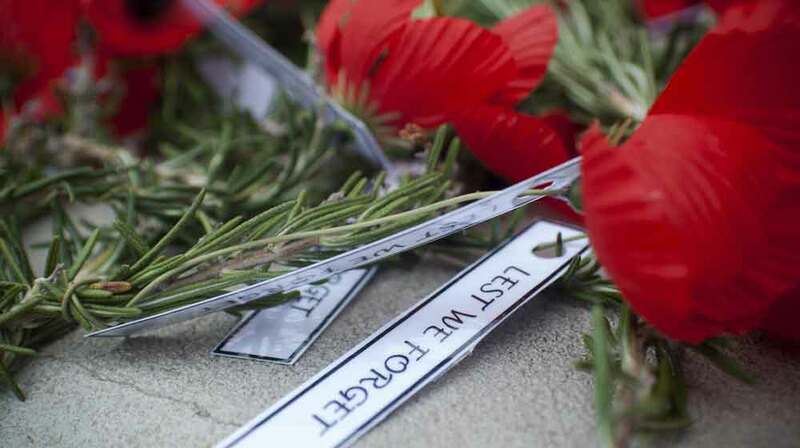 But it’s also a Holiday set aside for us to remember those of our military who have made the ultimate sacrifice. We encourage you to take a moment to sit quietly, remember and honor those courageous men and women. Shake a hand, share a hug, or just say “Thank You” to a family member or friend who is honoring the loss of a military loved one on this special day. 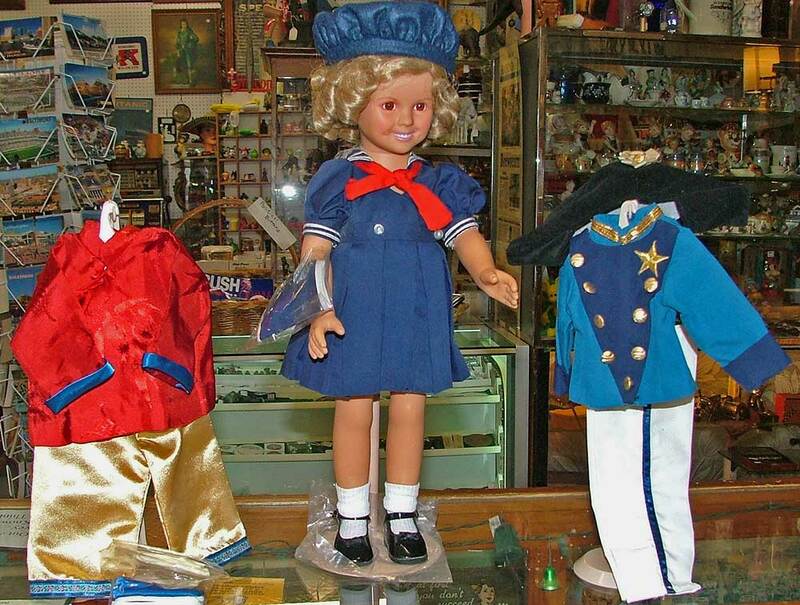 For those who love anything ‘military,’ here at Bahoukas Antique Mall, we have some interesting collectibles. 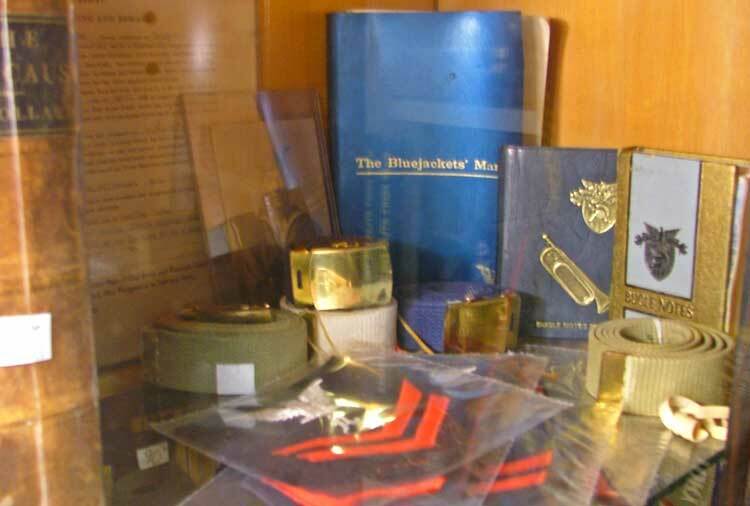 Books, insignia, belts, manuals and more are available in our Military Collectibles. Stop in and see if there’s a special item you’d like to add to your own collection. 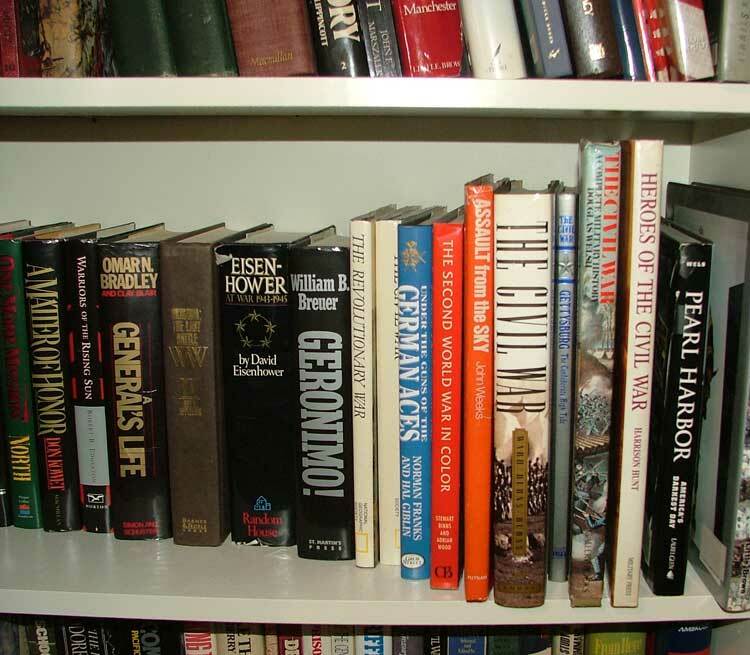 Just looking for an interesting item to add to a table or bookshelf in honor of our Military? Check this out! 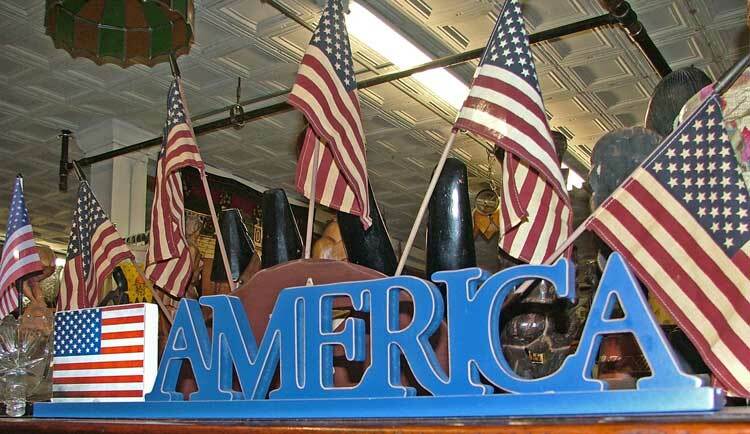 A stand of flags or the flag and AMERICA sign – either would look great on a picnic table! 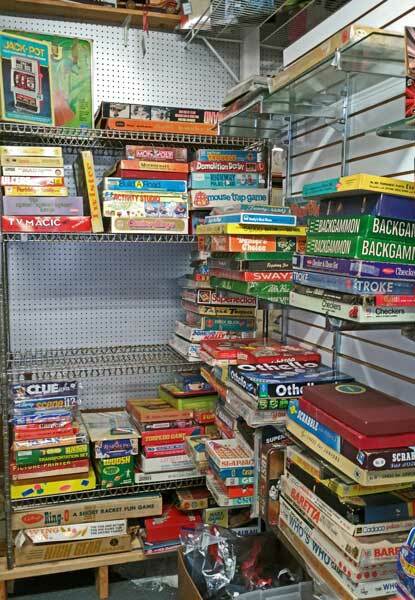 Of course, as you enjoy your weekend in Havre de Grace, stop by and browse Bahoukas Antique Mall and Beer MuZeum. Absolutely, we’ll be watchin’ for ya! We normally like to post Monday, Wednesday, and Friday. But we wanted to get this post out there to pique your curiosity enough that you’ll stop in and see the variety of beautiful jewelry we have for that special “MOM” in your life. These photos do not do justice to these trays of pins. There are some stunning pieces here. 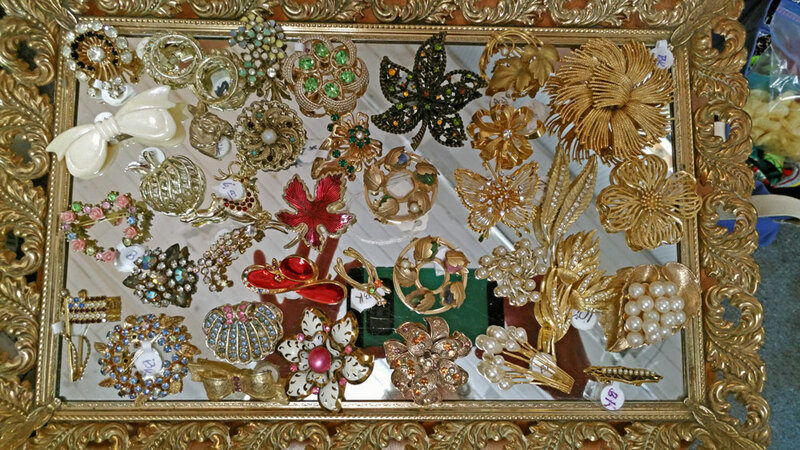 Stop in and see for yourself the beautiful bracelets, necklaces, earrings, and more that we have in our shop. 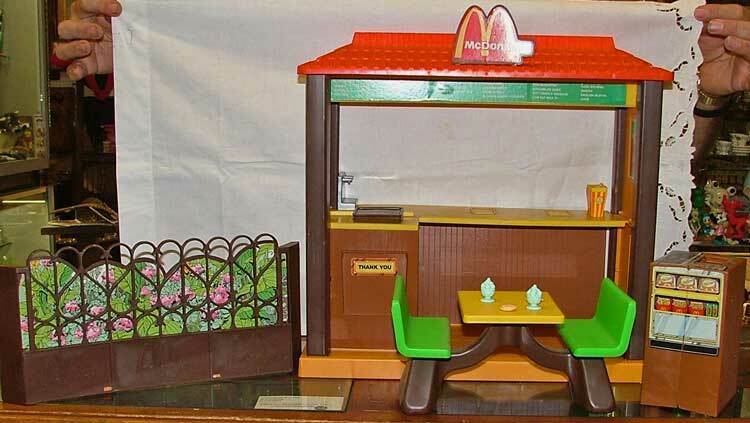 Prices start at just a couple dollars and up. Bring the kids to pick out something special for Mom and Grandmom. Hurry in to discover the perfect, beautiful piece or two of jewelry that will delight Mom and fit your budget. Truly, these photos do not do justice to these pieces. And, of course, we’ll be watchin’ for ya! 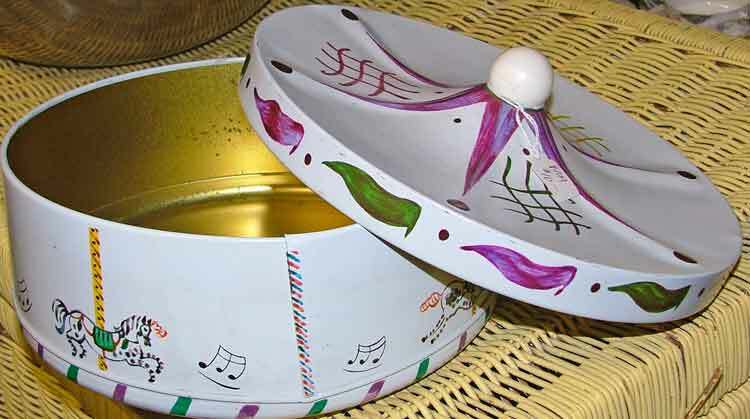 May, thoughts of outdoor picnics and barbeques, and great serving pieces make for perfect Mothers Day gift ideas. Below is a beautiful glass cake dish with a cover. Can you imagine the tasty dessert that will be served? YUM! 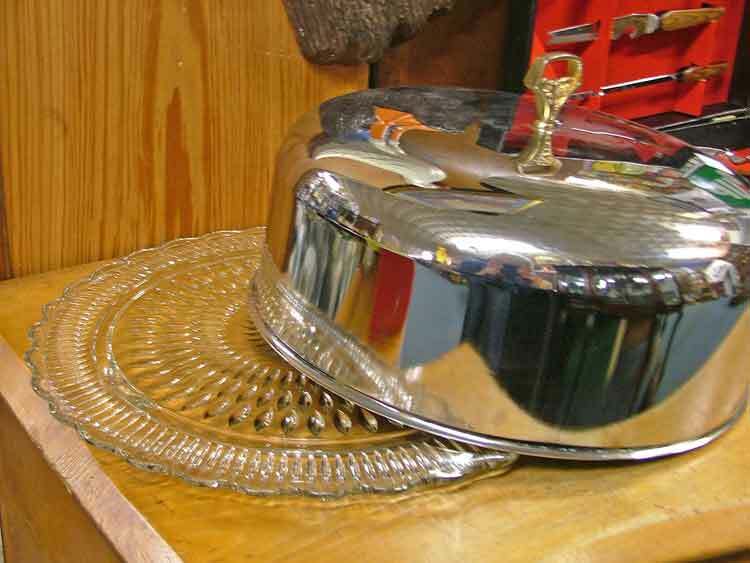 Maybe you need a dish for your casserole. Well, check this one! 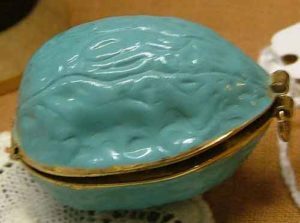 A glass-covered, Guardian Ware serving dish. Perfect! 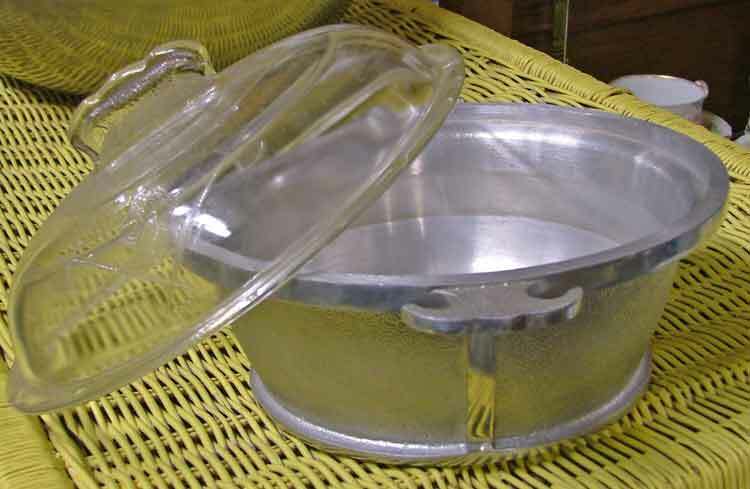 Has mentioned that she could sure use a few mixing/serving bowls? 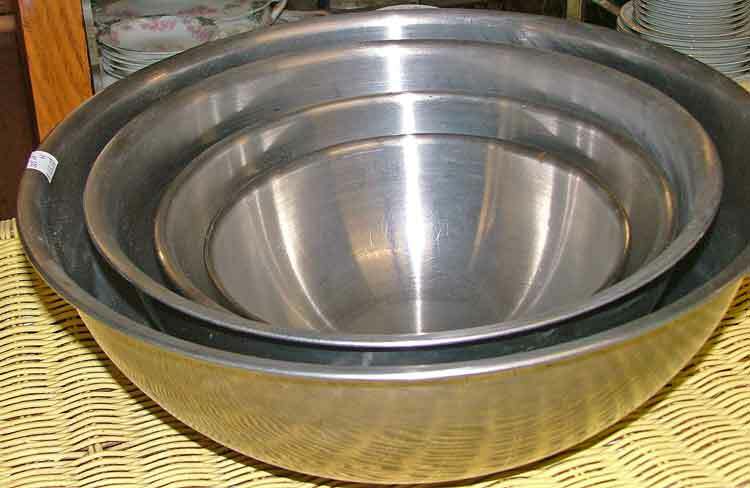 These stainless steel bowls below make it easy to mix your favorite salad, cover with plastic wrap and take directly to the picnic table. Those hungry kids will be so excited! 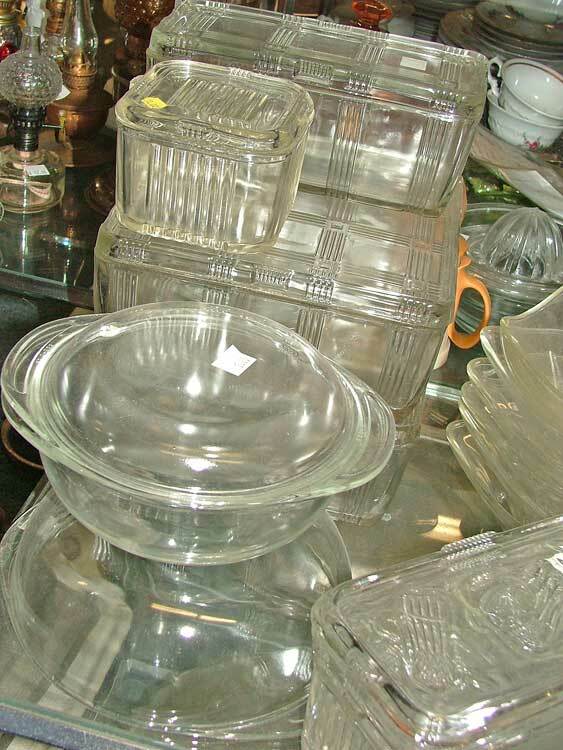 If you’re taking the cut-up veggies, a dip, maybe baked beans, these glass serving pieces with covers are perfect for the table and can go directly into the refrigerator/freezer afterward. Well, that’s if there’s anything left in them afterward! So if you’re thinking picnic, outdoor barbeques, or just a great gift for Mom this Mother’s Day, these pieces just might fill the bill. Yep, we’ll be watchin’ for ya! Please note that Bahoukas will be closing at 2 p.m.
today to prepare for our Family Holiday. Tomorrow you’ll be gathering up wrappings and the surprises will be over. The kids will excitedly play with new toys. Hopefully, mom and dad will have a chance to breathe a bit. To help you with your last minute shopping, here’s a link that shows you our 44 Days of Gift Giving Ideas. a bit of time with someone who may need a friend during this season. Need a Bit of Last Minute Holiday Decor? Candles – candles – candles will help to complete the decorations! 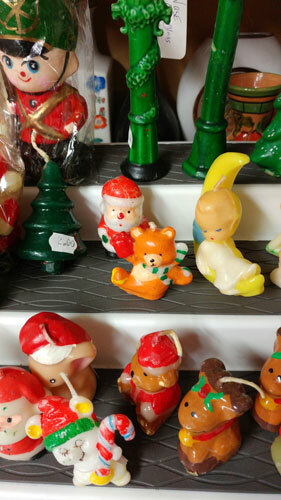 From very collectible candle figures above that include Santa, snowmen, Mrs. Claus, carolers, teddy bears and reindeer, we have a wonderful assortment of candles and candle holders to add the final touch to your holiday decorations! The above photos show more selection to our holiday figures, tall electric candle-lights for porch, deck or large entry way, and a sample of metal or wood candle holders. Beautiful additions to add a bit of ‘festive’ to your holiday decorating. 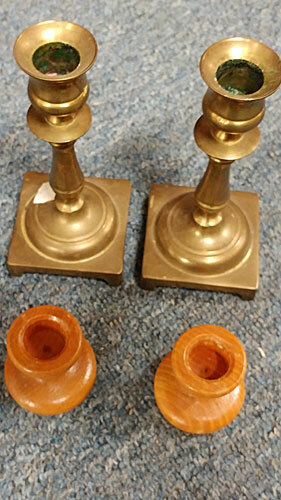 Below are several examples of candle holders that would add a taste of class to your holiday table or mantle. But they’re also beautiful and will add to your home decor in any season. 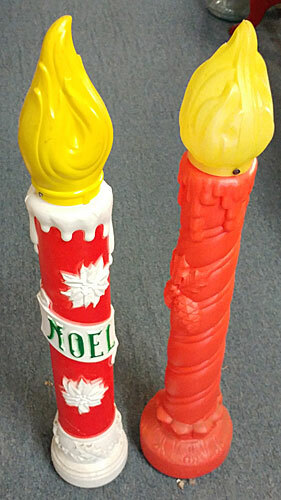 Below is a sampling of candle holders from just one of our many shelves of collectibles at Bahoukas. Needless to say, even in the least hours before the big celebrations for the holidays, we have some excellent choices to add warmth and charm to your home decor. Hurry in … we’ll be watchin’ for ya! 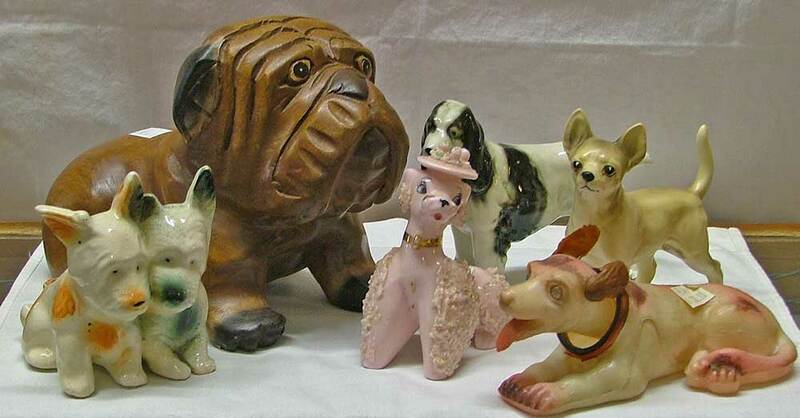 We can’t talk about dogs without including a post highlighting the feline variety of figurines available at Bahoukas Antique Mall. The tall cat would make a delightful addition to any cat lover’s collection. The little green kitty next to it and the Siamese in the front are perfect! 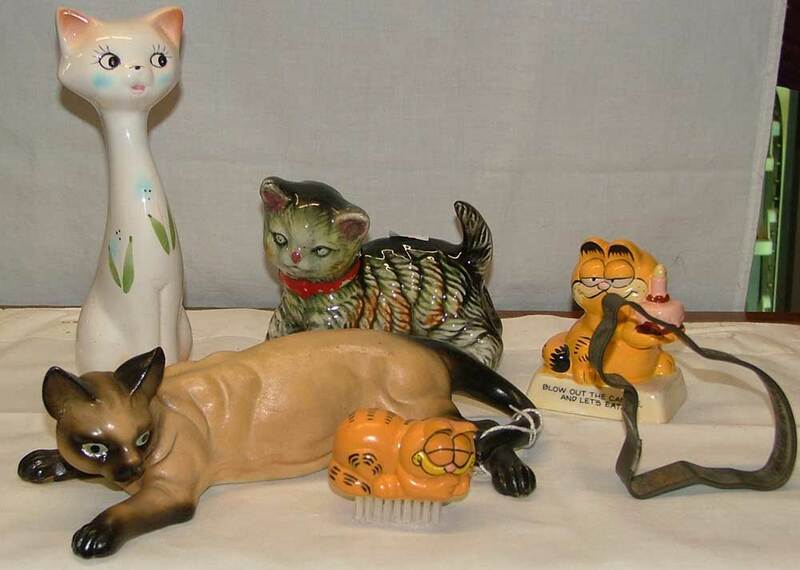 Garfield in the front is a nail brush and the one in the back celebrates a birthday. The metal cookie cutter cat is an advertising piece for Davis Baking Powder. As with the dogs, we have many more cat collectibles that may just fill a stocking and delight a collector, or anyone who loves cats. Stop by and see what we have. Remember this is day 41…. only 3 more days and it’ll be too late to grab that last minute special item from Bahoukas. Hurry in! We’ll be watchin’ for ya! The above photo includes a Lucky Strike cigarette tin, Prince Albert and Sir Walter Raleigh Tins, cigarette rolling papers, a cigarette roller from the 1950s-60s, and a Bugler Cigarette Case. The smoking tobacco pouch was for advertising, you could add your company. The beautiful gold plated cigarette case was made in England. It’s quite stunning. The ashtray also has a lighter, made from slag glass from the 1930s. 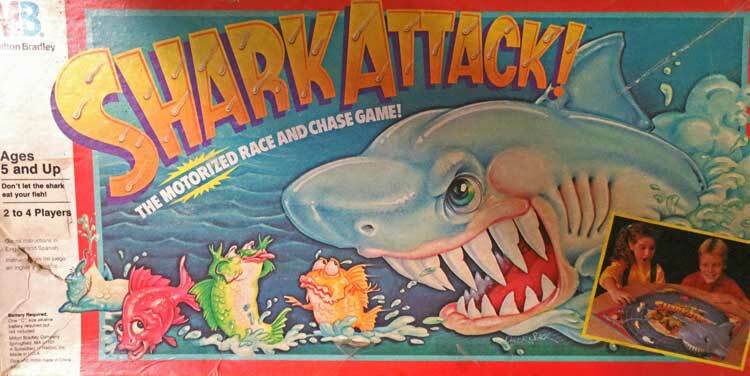 For the collector of cigarette memorabilia, there are some stunning items here. Stop by soon to grab the special piece you’d like to give the collector on your holiday list. Yep, we’ll be watchin’ for ya! Aurora 1960s models of Wolfman and Frankenstein have already been put together. Are you a collector… grab these up. Have someone who loves the comics, maybe they’d like one for their shelf. 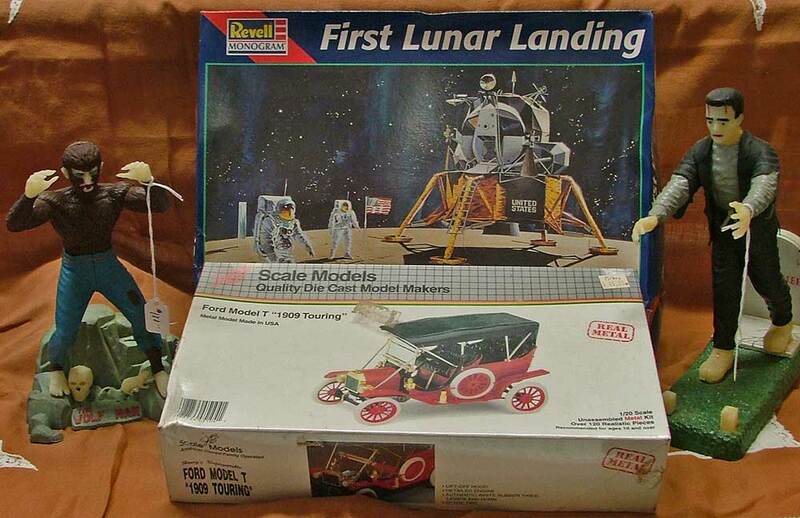 The First Lunar Landing by Revell is a 1996 model of the lunar module of 1969. Have an astronaut or science/history buff on your list, they might enjoy this model. There’s been debate forever as to whether we actually landed on the moon… but here’s a video. We’re sure the debate will continue for decades. The scale model of a 1909 Ford Model T Touring car is by Scale Models and made of real metal – never opened – from 1993. Here’s a great video of an unrestored Model T that was still running in 2015! Remember, there are just 6 days to grab a present through Christmas Eve! 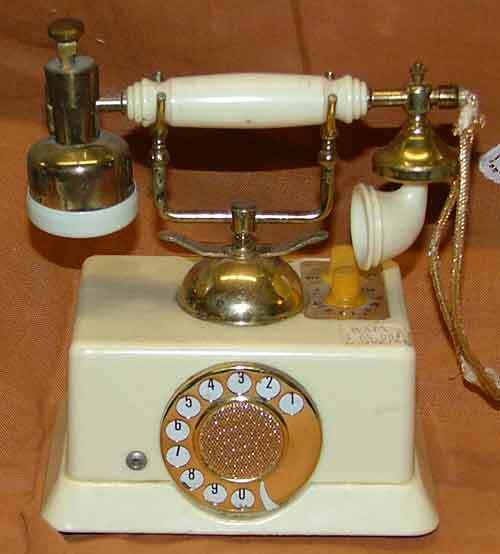 Stop by Bahoukas Antique Mall and let us give you a hand in finding that last minute perfect gift. We’ll be watchin’ for ya! Yes, these amazing collectibles are transistor radios. What fun! 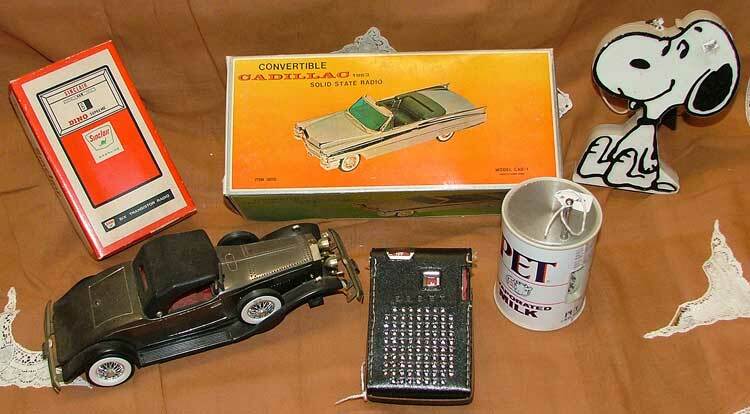 At top they include: Sinclair Gasoline radio, a beautiful Cadillac Convertible 1963, and Snoopy! On the bottom is a 1931 Rolls Royce, an Essex radio in a black leather case, and yes, a fun transistor radio in a PET Milk Can. 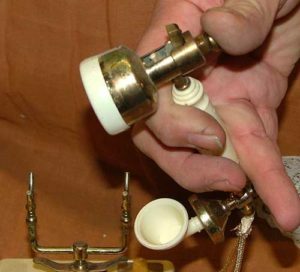 from the 1960s with a lighter in the handset! 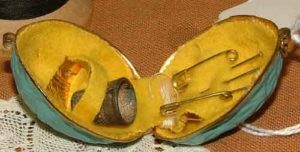 Do you remember your first transistor radio? The “weblady” remembers a boy in the neighborhood who had a brand new bike that had a radio built into it. WOW! The ingenuity of the design for transistor radios were often pieces of art … and more often used for advertising. No matter, you know you need to get your holiday gift purchases completed soon… we have a week! So hurry on in to Bahoukas in Havre de Grace and know that we’ll be watchin’ for ya! The choice of stemware available at Bahoukas Antique Mall is amazing. 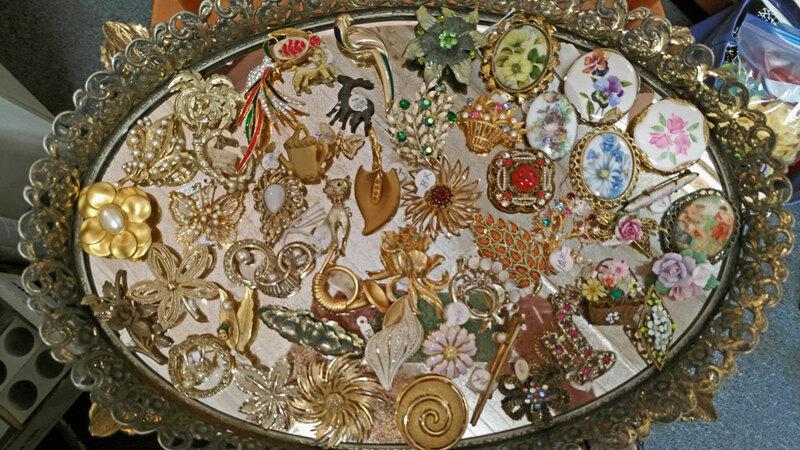 We can’t being to list all the choices, but we have hundreds of pieces available. 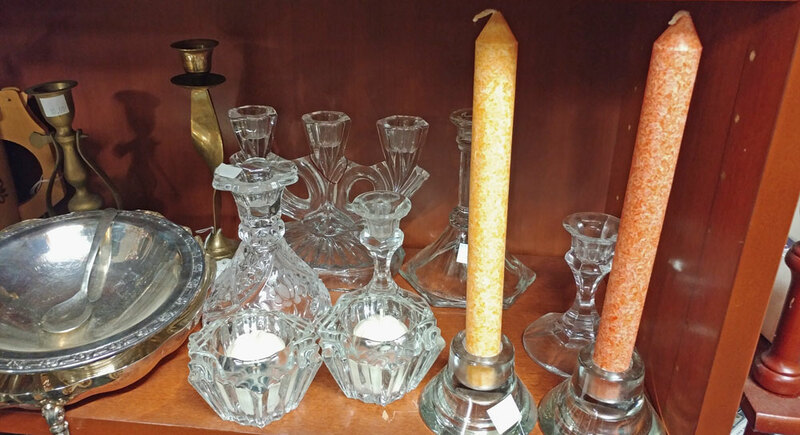 Some of the items above include: delicate etched glass, Ruby glass, wine glasses or cordials, even beautiful brandy snifters. The stemware selection is outstanding. But consider this, these pieces can also be used as dessert dishes, dainty fruit cups, even a beautiful tiny vase to add to your holiday decorating. Come on… get creative. Then hurry in… time is growing short. We’ll be watchin’ for ya! 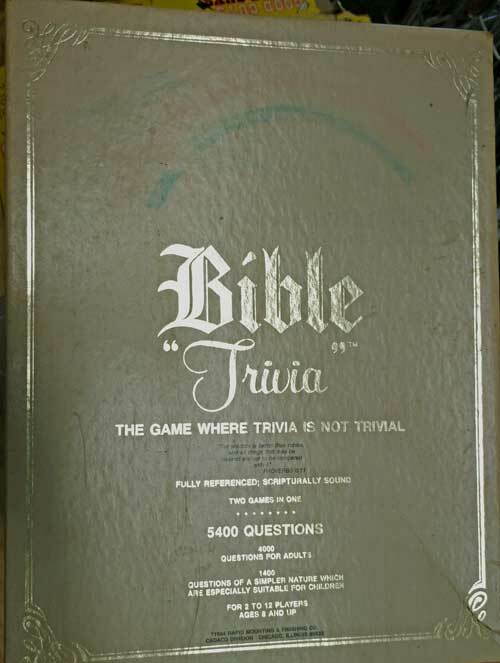 Here are some gift-ideas that you may not have considered being available at Bahoukas Antique Mall in Havre de Grace. 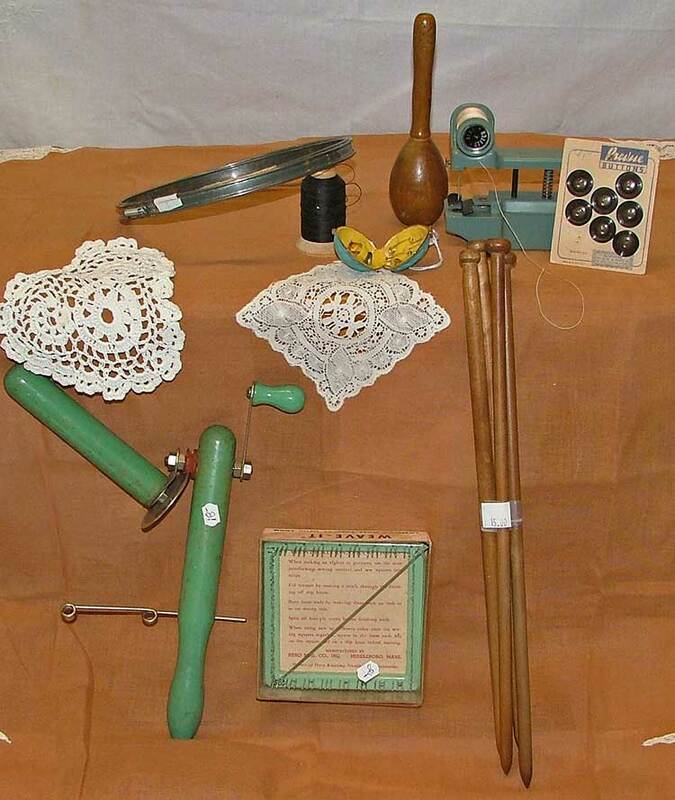 They include top: embroidery hoops, sock darning egg, a hand held sewing maching, buttons, doilies, a 1950s walnut sewing kit, a yarn ball winder, a small weaving loom, and wonderful wooden large knitting needles. This little sewing kit is really beautiful. It could also be used as a wonderful ornament for the seamstress on your list. Have anyone in mind? We also have a number of craft books and magazines, and even old sewing patterns. So stop by today because, you know, we’ll be watchin’ for ya!